Request a quote for a bulk order for SMAD2 polyclonal antibody - Classic. Please fill out the form here below. Your local sales account manager will get in touch with you shortly and send you a quotation based on your requirements. Polyclonal antibody raised in rabbit against SMAD2, using a KLH-conjugated synthetic peptide. 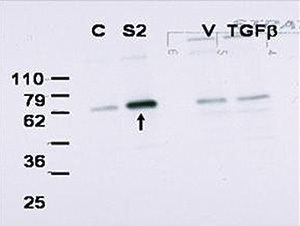 Western blot using the Diagenode antibody against SMAD2 to detect over-expressed SMAD2 in COS cells (arrow). Lane C shows mock infection of COS cells with lentiviral vector alone. Lane S2 shows detection of SMAD2 in lysates of COS transfected with SMAD2. Lane V contains lysates of MDA-MB231 cells treated with vehicle; the next lane contains lysates of MDA-MB231 cells treated with TGFß. Low levels of staining in control lanes correspond to detection of endogenous SMAD2. The membrane was probed with the primary antibody at a 1:2500 dilution. Diagenode strongly recommends using this:	SMAD2 polyclonal antibody - Classic (Diagenode Cat# C15410273 Lot# 001). Click here to copy to clipboard.